As time went on further details, including the price, were revealed. Last Thursday I found myself in a quandary - do I order a first generation product sight unseen or hold off for the time being and watch (pardon the pun) the product mature from the sidelines? A first world problem if there ever was one. After spending a couple of hours pouring through reviews, including this beautiful and timely exposé from the Verge, my enthusiasm started to wane a bit. While many of the reviews praised Apple’s innovation, they were quick to point out the Apple Watch’s first generation shortcomings. This thoughtful piece entitled Why I’m Not Getting An Apple Watch that was penned by my friend and fellow British Columbian, Mike Vardy also had me questioning my technological foray. Despite hovering my finger over the purchase button at 12:01am, I decided to hold off on my purchase and instead live vicariously through my Apple Watch-owning friends and colleagues while I contemplated the value of owning one of these technological marvels. My Friday morning commute took me past Vancouver’s Pacific Centre Apple Store. It occurred to me that the Apple Watch would be on display, and I figured it wouldn’t hurt to make a quick pitstop and give this new gizmo a gander. You can probably guess what happened next. While I wasn’t able to try one on that morning, I did get a chance to take a demo model for a short test drive. The Apple Watch made a good first impression and my experience with the device, combined with a chat with an enthusiastic member of Apple’s Business Team reinvigorated my interest. I figured it wouldn’t hurt to at least place an order, and that I couldn’t deliver a truly informed opinion without putting this tiny marvel to the test in my day-to-day life. So, I’m officially in the digital queue. While I won’t be the first kid on the block to sport this shiny new accessory, I figure I’m still eligible for the “early adopter” designation. After a successful first date, my technological courtship continued with another trip to the Apple Store this morning, where things got a bit more intimate. 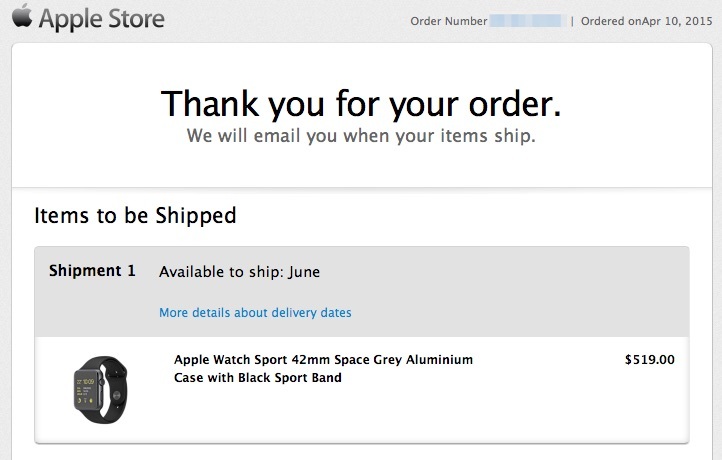 I tried on the black…I mean “Space Gray”…Apple Watch Sport model that I’d ordered. The stainless steel model (simply called the “Apple Watch”) outfitted with a Milanese Loop strap also spent a few minutes on my wrist. Both watches felt good, though the Apple Watch Sport was noticeably lighter and its cost and weight reassured my previous buying decision. Even without accessorizing with any fancy new bands, I wouldn’t have any qualms about wearing it to business meetings or even a gala event. Though, we tend to be pretty casual here in British Columbia. I didn’t get to take this new jewelry home, but at least have a few photos to tide me over until we’re reunited in June. Which brings me to my productivity experiment — one of my key justifications for taking the plunge so soon after this product’s inception. Stepping back for a moment, one of the motivations for founding Technically Simple was to guide and educate people on using technology, helping folks to make effective use of technology while avoiding unproductive pitfalls. True to Technically Simple’s roots, I’m setting out to discover whether the Apple Watch has the potential to enhance the quality of life and foster productivity, or if it’s more likely to be a source of unproductive distractions. I’m a strong advocate for healthy living (with the occasional indulgence) and am particularly curious to explore the Apple Watch’s potential to encourage healthy habits. A point I often emphasize in the productivity courses that I teach, is that technology isn’t inherently good or bad. Technology has the potential to be addictive by enabling an “always on” state that compromises relationships with other people and, perhaps most importantly, with ourselves. On the other hand, I’ve long been a proponent of technology’s potential to enhance productivity and to foster creativity and communication. My friend Dave Stachowiak and I pondered both perspectives when I was a guest on his excellent Coaching for Leaders podcast. While the jury is still out on the Apple Watch, my current thesis is that this device has productive potential as long as it’s used appropriately. Through my research, I plan to unearth best practices and best of class Apple Watch apps. I look forward to sharing my findings here on Technically Simple. I’ve shared my planned research with some friends, including some who are eagerly awaiting their new Apple Watch. Like me, they’re curious and intrigued by this device’s potential and are leery of potential shortcomings. I’ll be checking in with them regularly as I conduct my own research, and might even coordinate a video-conferenced panel discussion once all of us have had a good chance to kick the tires. If you’ve ordered an Apple Watch and would like to participate in this early research, drop me a line and share what motivated you to hop on the bandwagon right out of the gates along with any concerns you have around introducing the the Apple Watch into your life.